An emergency at the border? Two legal experts discuss the president's authority to invoke special power to build a wall on the southern border. Two cases for and against an emergency declaration. 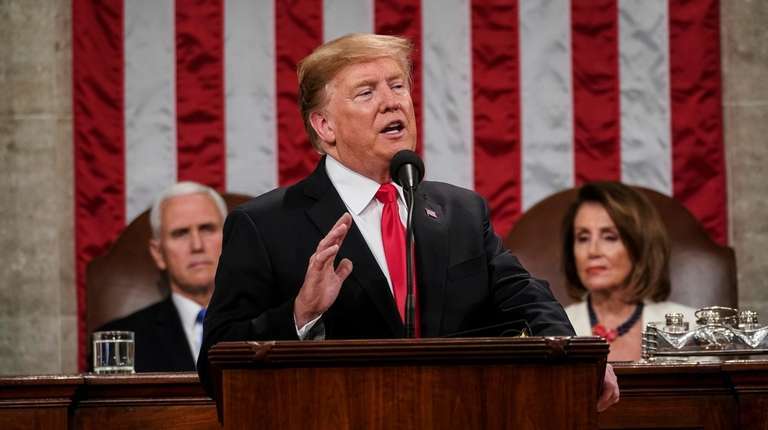 If Congress passes a resolution opposing any such national emergency proclamation, President Donald Trump could veto the resolution and Congress would likely have to live with the consequences of an inappropriate invocation of national emergency. He has repeatedly insisted that he can and will build the wall after declaring a national emergency at the border. If the president proceeds, he will undermine the role of Congress in our constitutional system and make a mockery of the uses of this extraordinary emergency power as exercised by modern presidents. Rhetoric and politics aside, consider a dispassionate assessment of what the law permits. In the end, Congress may already have given Trump the authority he needs to build his wall. The president exercises whatever powers he has from the Constitution or an act of Congress. The Constitution does not confer any general emergency powers, and only permits suspending the writ of habeas corpus “when in Cases of Rebellion or Invasion the public Safety may require it.” When it comes to appropriating public funds, the Constitution anchors the power in Congress. The Congress appropriates funds, and the president spends them. Historically, Congress provided generous statutory authorities that allow the president to act and spend in circumstances that rise to the level of national emergency. By 1973, there were more than 470 such laws, most of them vestiges of bygone crises. In a stroke of Watergate-era good government, Congress enacted the National Emergencies Act in 1976 to repeal all emergency laws and create procedures for future presidents to act responsibly in a crisis. However, while enacted with the best of intentions to rein in misuse of presidential emergency powers, the law has, in a backhanded way, enabled considerable presidential initiatives. The National Emergencies Act requires presidents to specify the statutory authorities they intend to use after declaring a national emergency, make public notice of the emergency declaration and renew such authorities annually in writing to Congress. However, the law requires Congress to act (with a two-thirds majority to overcome a presidential veto) to terminate a declared emergency and allows declared emergencies to be renewed annually by the president. Intended to stop the practice of endless states of emergency, the law gave them new life. Today, there are 28 national emergencies, renewed for decades by presidents, supported by 136 statutes the president can invoke after an emergency declaration. Congress has never attempted to terminate an emergency declared pursuant to the National Emergencies Act. Nor are there criteria to guide or limit the president in deciding what constitutes a national emergency. Could Trump declare a national emergency at the Southern border? Yes, unquestionably. Could he then find the funds from among the 136 statutes to order construction of the wall? Yes, arguably. A law enacted in 1982 enables the president, after a declaration of a national emergency “that requires the use of armed forces,” to order the secretary of defense to undertake military construction projects not otherwise authorized by law “necessary to support such use of the armed forces.” Although presidents have relied on this specific authority to fund projects at military bases overseas, the law does not dictate that the spending occur only adjacent to military bases or only to those abroad. There is more than Trump’s requested $5.7 billion available now in unobligated but appropriated military construction funds. It’s debatable that construction of the border wall requires the use of armed forces, or that the wall project is necessary to support the military. The border and a new wall project would be enforced by civilian personnel from Customs and Border Patrol, part of the Department of Homeland Security. Although Trump has deployed U.S. forces to the Southern border to support Border Patrol personnel, it is far from clear the construction project is necessary to support the military’s role. No doubt an emergency declaration by Trump to build the border wall with unspent military construction funds would be challenged in court. Local landowners facing eminent domain and perhaps local governments would likely have standing to sue. The military construction law has never been construed by a court, and it is as likely as not that a court would either dismiss a lawsuit as presenting a political question not amenable to judicial disposition or find the operative terms in the 1982 law sufficiently ambiguous to justify deferring to the president’s interpretation. The point is this: There is a legally defensible way for Trump to use emergency authorities to construct a border wall. Whether there is, in fact, a national emergency at the Southern border is a different question, one that the National Emergencies Act does not require the president to answer. If, as Senate Majority Leader Mitch McConnell has warned, Congress passes a resolution opposing any such national emergency proclamation, Trump could veto the resolution and Congress would likely have to live with the consequences of an inappropriate invocation of national emergency authority that Congress itself authorized in 1976. William C. Banks is a professor of law, public administration and international affairs at the Syracuse University College of Law and the university’s Maxwell School of Citizenship and Public Affairs. We must consider whether President Donald Trump’s threat to declare a national emergency is both legally credible and factually compelling. I believe it is both. Securing the Southern border is popular among many in the American electorate, but opposed by open-border activists on the left and cheap-labor crony capitalists on the right. We have seen members of Congress vote in favor of border security, including authorizing a wall on the Southern border that they can tout to their constituents at election time, but vote against the appropriation bill that would fund it. President Donald Trump’s willingness to expose this hypocrisy is the key to understanding the 35-day partial government shutdown that ended on Jan. 25, as well as to understanding the renewal of the standoff when the three-week temporary government funding authorization expires on Friday. Because Speaker Nancy Pelosi’s position is no funding for the border wall, a renewal of the standoff seems likely. Therefore, we must consider whether Trump’s threat to declare a national emergency is both legally credible and factually compelling. I believe it is both. The National Emergencies Act of 1976 authorizes the president to declare a national emergency, and every president since it was enacted has issued such declarations under the statute’s authority. Some national emergency declarations, such as President George W. Bush’s in the aftermath of the 9/11 attacks, have been in response to catastrophic events, but many others did not rise to that level. President Barack Obama declared a national emergency for the swine flu in 2009, and President Bill Clinton declared national emergencies to deal with vessels traveling to Cuba and people engaging in transactions with Sudan. Indeed, of the 54 national emergency declarations issued since 1976, 28 remain in effect. Presidents have employed the statutory authority so frequently, and renewed it so regularly, because a national emergency declaration allows the president to trigger a host of other statutory authority that is only available during a national emergency. U.S. code (33, Section 2293). It allows the secretary of defense to redirect funds from any military construction project and apply them to “military construction, and civil defense projects that are essential to the national defense,” as long as the national emergency “requires or may require use of the Armed Forces.” This statute allows only the redeployment of funds to projects already authorized, so it could be used only to help finish the 700-plus miles of border wall authorized by the Secure Fence Act of 2006, which passed overwhelmingly in both the House and the Senate. Completion of that previously authorized expanse of wall would add significantly to border security. U.S. code (10, Section 2808). It authorizes the secretary of defense to undertake military construction projects “not otherwise authorized by law that are necessary to support” the use of the armed forces in dealing with the emergency. Given Trump’s decision last year to commit troops to help with border security efforts, the necessity of using the military is a determination unlikely to be second-guessed by the Supreme Court. The 1952 Immigration and Nationality Act. It established an Immigration Emergency Fund that is replenished annually to the sum of $35 million. Those funds can be used upon declaration of an immigration emergency, which is defined to include “an actual or imminent influx of aliens which ... is of such magnitude ... that effective administration of the immigration laws of the United States is beyond the existing capabilities of the” immigration services. Clinton twice issued proclamations to use fund money to pay for the repatriation of foreign nationals being smuggled to the United States. Trump could authorize the use of such funds for the construction or improvement of a border wall to assist the immigration services as well. There are thus statutory authority and appropriations for Trump to make good on his promise to build a wall to strengthen border security, and to help stem the tide of illegal immigration, human trafficking and drug smuggling, even if the next round of budget negotiations doesn’t yield additional funds for the purpose. John C. Eastman is professor of law and community service, former dean at Chapman University’s Fowler School of Law, and a senior fellow at The Claremont Institute, a conservative think tank.